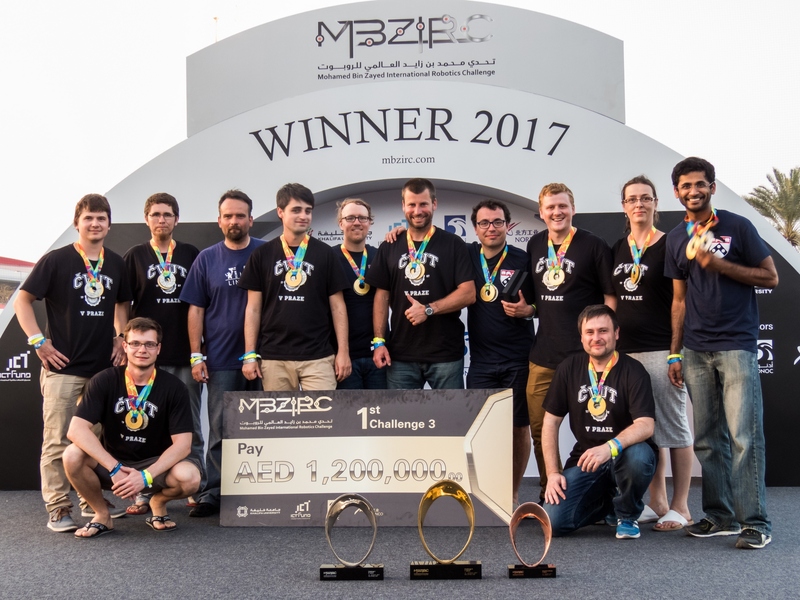 On the Abu Dhabi Formula 1 racetrack, the YAS Arena, the prestigious Mohammed Bin Zayed International Robotics Challenge (MBZIRC) took place on 16 and 17 March. Here, the team of Dr. Martin Sasek of the Faculty of Electrical Engineering, accompanied by a representative of the American University of Pennsylvania and the British University of Lincoln (Tomas Krajnik, now member of dept. of Computer Science), won first place in the discipline of cooperative collection of objects using a group of autonomous helicopters and took silver position in the category of autonomous landing on a moving vehicle. This success earned the team the possibility to participate in the Grand Challenge competition, in which they have won the bronze medal together with colleagues from the Italian University of Padua. In overall evaluation, the CTU team achieved 97,653 points out of the maximum 100 in the category of autonomous landing on moving vehicle. The team thus ended second, with less than 1 point away from the 1st place. The team than took the 1st place in the category of collecting objects by swarm of drones with the overall score of 56,154 points. The drones collected the objects in complete autonomous mode, a technology that is at the very edge of current scientific knowledge. The team of the Faculty of Electrical Engineering placed well ahead of teams from world-renowned universities such as Carnegie Mellon, ETH Zurich, Georgia Institute of Technology, Virginia Tech, The University of Tokyo, and Korea Advanced Institute of Science and Technology. A total of 143 teams (in four competition categories) from 35 countries have signed to the Mohamed Bin Zayed International Robotics Challenge (MBZIRC) with 25 of them selected for finals.